5 Step Wet Steps Dock Ladders. 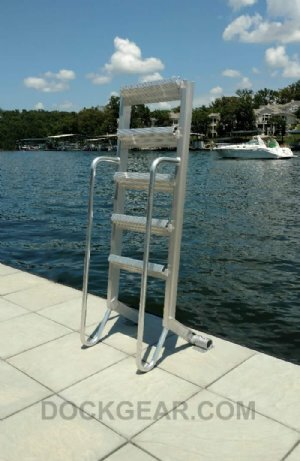 5 Step Wet Steps Dock Ladders are constructed from heavy-duty marine grade aluminum. With a 55 degree climb angle it's just like climbing stairs plus each side has safety handrails for extra stability when climbing in or out. Constructed using high-quality marine grade aluminum with a u-channel frame. All welded construction with BOLT-ON steps. Built solid with a 500 lb. weight capacity. Wet Steps can rotate 180 degrees out of the water in a swing or flip up manner. Safety pin keeps ladder stowed in upright position when not in use. 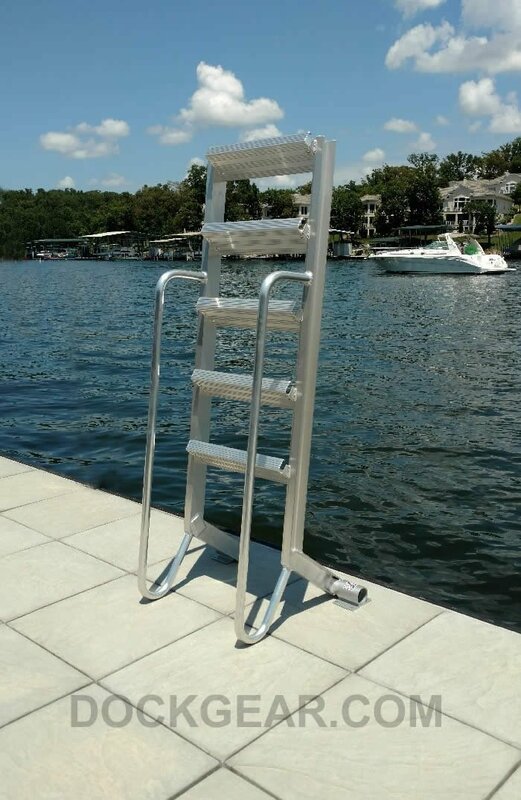 Overall Ladder Length (from mounting point to end of ladder, in the water): 52"
Adults and Teenagers - these ladders are not only easy to climb and safe, but they look cool too. Check out the flashy powder coat color options available for an extra fee. Elderly and Children - with the easy 55 degree climb angle and safety handrails this ladder is ideal for elderly folks and children who need and want a safer ladder design. This ladder is truly like climbing a set of stairs with handrails. 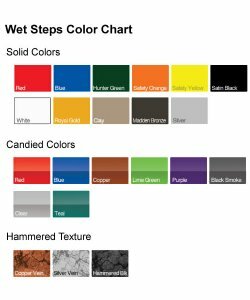 Pets - Wet Steps are built to a relaxed angle that makes climbing in and out extremely easy. You don't have to assist your pets up and down the ladder. "Dock Steps used for Pool Steps"
Review Comments: I have an above ground pool with a deck built slightly higher than the resin top. I wanted a pool ladder that did not rest on the vinyl liner side or bottom. This dock ladder worked perfect!! Flip it up out of the way when time to cover the pool. Seemed pricey at first but when I got it and put it to use I quickly forgot the price. Well built and designed!! !